Steven Michael Stone (born July 14, 1947) is an American former Major League Baseball (MLB) player, and current sportscaster and author. Stone pitched for four MLB teams between 1971 and 1981. In 1980, he was the AL Cy Young Award winner, and an American League All Star, finishing the season with a record of 25–7. He was WGN-TV's color commentator for Chicago Cubs broadcasts between 1983 and 2004, missing a couple of seasons late in his tenure due to health problems. He worked in radio until 2009, when he became the color commentator for Chicago White Sox television broadcasts. Stone is Jewish, and was born in South Euclid, Ohio, a Cleveland suburb. Stone played high school ball at Charles F. Brush High School for baseball Coach Jim Humpall. Growing up he also won several tennis championships, was a ping pong champion, and a proficient golfer. At Kent State University, Stone was an outstanding pitcher and his catcher was Thurman Munson. He was selected to the All Mid-American Conference team, and was named team captain as a junior. He had a 2.00 ERA in the Cape Cod League in 1968. He also starred on the bowling and volleyball teams. He became a Brother in Alpha Epsilon Pi Fraternity. He graduated in 1970 with a teaching degree in history and government. In 1968 he was drafted by the Cleveland Indians in the 16th round of the draft, but did not sign. In February 1969 he was drafted by the San Francisco Giants in the fourth round of the draft (secondary phase). From 1969–71 Stone pitched in the minor leagues, compiling a 32–24 record and striking out nearly a batter an inning. Charlie Fox (manager of the Giants in 1971) felt the only way a ballplayer could perform was to chew tobacco, wear a sloppy uniform and, as he put it, not be afraid to get a bloody nose, and eat, drink and sleep baseball. I never thought a bloody nose was all that comfortable, and tobacco upsets my stomach. I like to eat – but not baseball – and I never thought sleeping with the game would be all that enjoyable. I think he thought reading hurt your eyes. In November 1972, after suffering a sore arm, Stone was traded by the Giants with Ken Henderson to the Chicago White Sox for Tom Bradley. In 1973 he was fourth in the AL in strikeouts per 9 innings pitched (7.04), and 8th in hit batsmen (7). In December 1973 he was traded by the White Sox with Jim Kremmel, Ken Frailing, and Steve Swisher to the Chicago Cubs for Ron Santo. In 1975 he was 12–8 and pitched 214.3 innings. In November 1976, after suffering a torn rotator cuff and undertaking cryotherapy after refusing surgery and cortisone injections, he signed as a free agent with the Chicago White Sox for $60,000 ($317,000 today), turning down offers from 4 other teams. In 1977 he was 15–12. During that year on August 29 Stone gave up a home run to Cleveland Indians second baseman Duane Kuiper – Kuiper's only career home run in 3,379 at bats. In November 1978, he signed a 4-year, $760,000 ($2,762,000 today) deal as a free agent with the Baltimore Orioles, again turning down four other offers. In 1979 Stone was 11–7, and was 7th in the league in fewest hits allowed per 9 innings pitched (8.37). His best year was 1980, when he went 25–7 for the Orioles, won the Cy Young Award and The Sporting News Pitcher of the Year Award, and came in 9th in the AL MVP voting. Stone's relief pitchers did not blow a save for him all season until his last start of the year. He led the league in wins and won-lost percentage (.781), and was second in games started (37), seventh in ERA (3.23), strikeouts (149), hits allowed/9 IP (8.04), and hit batsmen (6), and ninth in innings (250.7). He also pitched three perfect innings in the All-Star Game that year. "I knew it would ruin my arm. But one year of 25–7 is worth five of 15–15." Stone threw as many as 73 curveballs in a game at least twice that season, even though he knew he might damage his pitching arm. "I used to try not to lose before", Stone said in 1980. "Now, when I go out, I go out to win every time, and I'm certain I am. I try to envision myself literally walking off the mound a winner. I allow no negatives in my thinking. When certain ones start creeping in, I erase them and make it like a blank blackboard waiting to be filled in with things like, 'The team is going to play well, is going to score some runs, I'm going to throw strikes, I'm going to win.' "
Stone suffered from tendinitis in 1981, going 4–7 with a 4.60 ERA, and retired at age 34. He is considered one of the best Jewish pitchers in major league history. Through July 2011, Stone was third among Jewish pitchers in career wins (107) and strikeouts (1,065), behind Ken Holtzman and Sandy Koufax and directly ahead of Jason Marquis, and ninth in games pitched (320), behind Barry Latman. Reminiscing about Sandy Koufax's influence on him and others when he was a child, he said, "He gave little Jewish boys some hope." 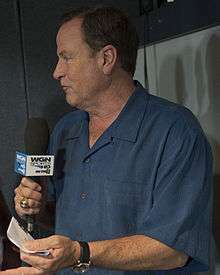 In 1983, Stone became a color commentator for the WGN television broadcasts of the Chicago Cubs, teaming for 14 years with Hall of Fame announcer Harry Caray. After Harry Caray's death in February 1998, Stone was paired with Caray's grandson Chip Caray. Stone left the booth due to health reasons in 2000, including a case of coccidioidomycosis, and returned to the Cubs booth in 2003 and 2004. Stone refused a contract extension as the Cubs color-man after the 2004 season amid a controversy involving Cubs players who felt he was being overly critical of their performance. Even so, he was a fan favorite. This was apparent at the Cubs' last home game of 2004, when, after the game had ended and all the players had left the field, nearly everyone left in the stadium looked up to the broadcast booth and chanted "Stoney! Stoney!" for several minutes. One reason he was so well-liked was his ability to accurately predict what might happen in various game situations, explaining to the audience why the strategy or pitch would be successful prior to the play. A famous example of this was him expressing "I wouldn't pitch to this guy" in a 2004 game, seconds before the batter (Adam Dunn) hit a home run off Cubs pitcher Mike Remlinger to give the Reds the lead. Stone expressed frustration with Cubs manager Dusty Baker for not controlling his players. At one point during the 2004 season, Kent Mercker called the broadcast booth from the bullpen during a game to complain about comments made, also confronting Stone in a hotel lobby. Among the comments that reportedly irked Mercker were Chip Caray's praise of Houston Astros pitcher Roy Oswalt. It was also reported that Mercker and left fielder Moisés Alou shouted at Stone on a team charter plane to a road game in 2004, and that Alou tried to have Stone and Caray banned from the team charter flights. On September 30, 2004, in the wake of a 12-inning loss to the Cincinnati Reds that all but eliminated the Cubs, Stone strongly criticized the team. "The truth of this situation is [this is] an extremely talented bunch of guys who want to look at all directions except where they should really look, and kind of make excuses for what happened...This team should have won the wild-card [playoff berth] by six, seven games. No doubt about it." The comments stunned manager Baker, and were a factor in Stone's resignation as a Cub broadcaster the following month. In early 2005 Stone was hired by Chicago radio station WSCR to provide commentary and host a weekly talk show, hosted on Mondays by Terry Boers and Dan Bernstein, on Tuesdays by Mike North, and on Thursdays by Brian Hanley and Mike Mulligan. He was also hired by ESPN to work some of that network's baseball telecasts. In early August 2007, Stone filled in for Chicago White Sox color commentator Darrin Jackson, while Jackson took leave for the birth of his child, during which he successfully predicted a walk-off home run by Juan Uribe in extra innings. In October 2007, Stone called postseason games for TBS, partnered with play-by-play announcer Ted Robinson. On March 4, 2008, Stone was named the color commentator for White Sox radio broadcasts for the 2008 season on WSCR AM670 The Score, replacing Chris Singleton, who moved to ESPN's Baseball Tonight. On September 13, 2008, Stone accepted the job as the color commentator for the White Sox television broadcasts for six years beginning with the 2009 season. He said he enjoys being in the booth with Hawk Harrelson, stating that he likes his nickname "Stone Pony." Stone also acts as a fill-in play-by-play announcer when Harrelson isn't available. In 1999, Stone, along with Barry Rozner of the Chicago suburban area Daily Herald, authored Where's Harry?, a memoir of his experiences with Harry Caray in the WGN booth. 1 2 3 Horvitz, Peter (2001). The Big Book of Jewish Baseball: An Illustrated Encyclopedia & Anecdotal History. SP Books. p. 180. ISBN 1-56171-973-0. ↑ "Stone on golf: 'I just get up and hit it'". Chicagotribune.com. May 15, 2010. Retrieved January 22, 2011. ↑ "Jewish Baseball Stars". Jewsinsports.org. Retrieved January 22, 2011. ↑ "Steve Stone Statistics". The Baseball Cube. Archived from the original on February 27, 2011. Retrieved January 22, 2011. ↑ "Exhibit Page". Jews In Sports. Retrieved January 22, 2011. ↑ James, Bill; Neyer, Rob (June 15, 2004). The Neyer/James Guide to Pitchers: An Historical Compendium of Pitching, Pitchers, and Pitches. Simon and Schuster. p. 395. ISBN 9780743261586. Retrieved May 25, 2012. ↑ "Jews In Sports". December 17, 2010. Retrieved January 22, 2011. ↑ Slater, Robert (2008). Great Jews in sports. The University of Michigan. p. 275. ↑ Horvitz, Peter (2007). The Big Book of Jewish Sports Heroes: An Illustrated Compendium of Sports History and The 150 Greatest Jewish Sports Stars. SP Books. p. 52. ISBN 1-56171-907-2. ↑ Levine, Peter (1993). Ellis Island to Ebbets Field: Sport and the American Jewish Experience. Oxford University Press. p. 243. ISBN 0-19-508555-8. ↑ Rielly, Edward (2006). Baseball in the classroom: essays on teaching the national pastime. McFarland. p. 52. ISBN 0-7864-2779-5. ↑ "Jewish Major Leaguers Career Leaders". Jewishmajorleaguers.org. Retrieved January 22, 2011. ↑ Leavy, Jane (2010). Sandy Koufax: A Lefty's Legacy. HarperCollins. p. 193. ISBN 0-06-177900-8. ↑ Schollmeyer, Josh, Stone in Exile Chicago Magazine, October 2007. ↑ "Donovan: Second half went sour for these clubs". Sports Illustrated. September 3, 2004. Retrieved January 22, 2011. ↑ Carrie Muskat. "Stone's criticism surprises Cubs". MLB.com. Retrieved January 22, 2011. ↑ "Steve Stone Resigns". The Cubs Chronicle. October 28, 2004. Archived from the original on March 17, 2010. Retrieved January 22, 2011. ↑ Goldman, David (2006). Jewish sports stars: athletic heroes past and present. Kar-Ben Publishing. p. 16. ISBN 1-58013-183-2. ↑ PostmanR %BloggerTitle% (August 9, 2007). "PostmanR AolNews". Aolnews.com. Retrieved August 25, 2011.